I'd had Reggie for 1 week. The pet section guy told me to give it 1 week and see if Reggie would become more comfortable in his new home, and relax around me. Well, Saturday was the 1 week mark. 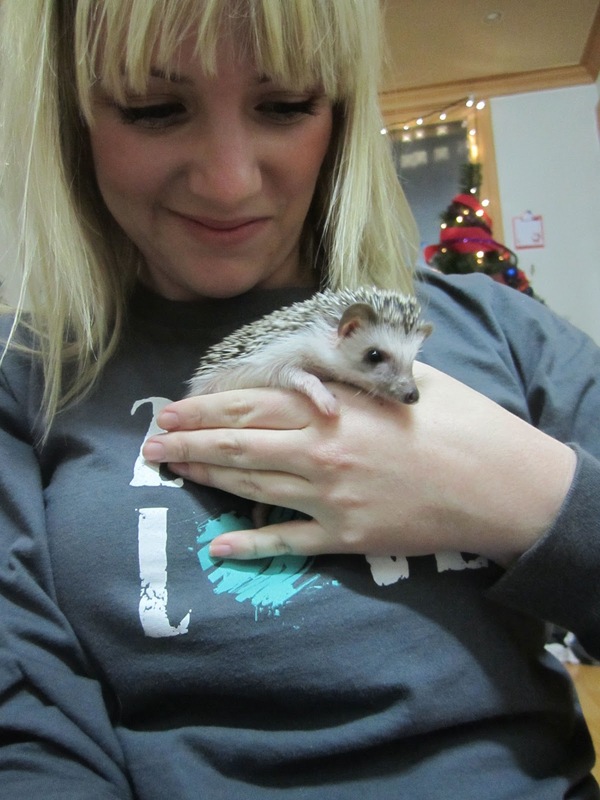 All week I had been so stressed out about this dang hedgehog. Was it comfortable? Was it happy? Would it eventually like me? Was it worth waiting months and months to find out if he would? Etc, etc. He was not making me happy like I'd hoped, and I wasn't doing much for him either. After hanging out with Tab on Saturday (mexican food and a movie, which was pretty much the best afternoon ever), my journey home took me through the station where E-Mart is located (Wangsimni). I decided to pay a visit to my friend, the pet section guy. I didn't want to have Michelle call him again; being the middleman stinks and she wouldn't know exactly what I wanted her to say. So, I headed into E-Mart. The guy recognized me immediately, and even though he spoke exactly ZERO English, I could tell from his look that he was saying "I'll be with you in a second!" (He was bagging some fish for 2 little Korean girls). He walked over and started to say something in Korean, and pulls out his phone and says "friend?" (as in: "Do you want to call your friend who speaks Korean so we can actually talk?) Well, my phone had died during the movie so I couldn't. I shrugged, and we walked over and looked at the little hedgies in their cage. 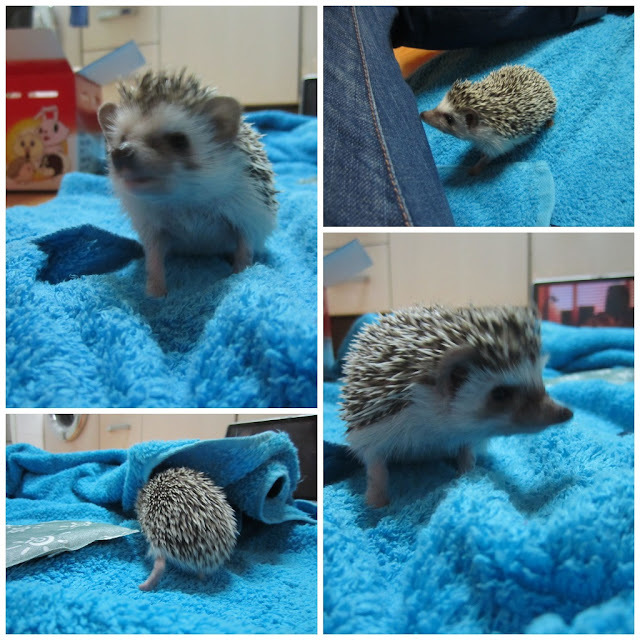 Man: Do you want to exchange your hedgehog? Me: Well, uhm, mine is okay but he always bites me. Me: Do you think I should? Man: No refunds, only exchange. Me: Right, right... but do you think I should? Man: This one (in my hands, currently pooping on me) is most kind and easy to handle. Me: You told me the same thing about Reggie. Man: Well, this one is very good. Me: How long do I have to think about it? Me: Hmm... okay. But, do you think I should exchange? Man: I think it is probably best. Me: Okay, I'll be back! I take the subway back home and put a bunch of bedding in the box for Reggie, and somehow manage to get him in the box as well (no small task). I decided to take him back in a taxi, not only because I was absolutely exhausted and taking public transportation is a process, but also because I didn't want to take him back totally traumatized. On the journey back to Wangsimni (which was 4,100W - so cheap!) I thought about my time with ol' Reg. I think I really made some mistakes with him, from the beginning. For one, I took him home with me on the subway. The subway is full of loud noises, sudden motions, and I was probably not as careful as I should have been. I also didn't handle him right away, I let him have his space to get used to his home. While this would be the right thing to do with a human, for Reggie I think it just pushed him away. I also think that once he bit me, I became really afraid of him. And apparently these animals (like many others) can smell fear. And I'm not joking!! I think our bodies release some kind of odor that they can literally smell that tells their tiny brains "there is something to be afraid of!" When we got home, it was settled. She was Rosie. I took her inside and took her out of the box confidently. I really tried not to be scared. She did NOT bite me!!!!!! Hallelujah! She was a little nervous, and pooped a little, but mostly she just sniffed around me. She crawled all over, and even got on the back of my neck before I could pull her down. I wanted her to get to know my smell very well. Finally, after about 15 minutes, I put her in the cage (I cleaned it out and replaced the bedding and fully washed the wheel first!). She was such a curious and silly little monkey!!! And by monkey, I mean MONKEY. This little girl, first thing she does is climb on top of her house. ON TOP OF. I pulled her down so she wouldn't hurt herself falling, and pushed the house away from the sides of the cage. Then she started climbing up the walls of the cage. She fell a few times, but not far and she kept trying again and again. She got to where her nose went thru the top wires. I was shocked! Monkey is right! 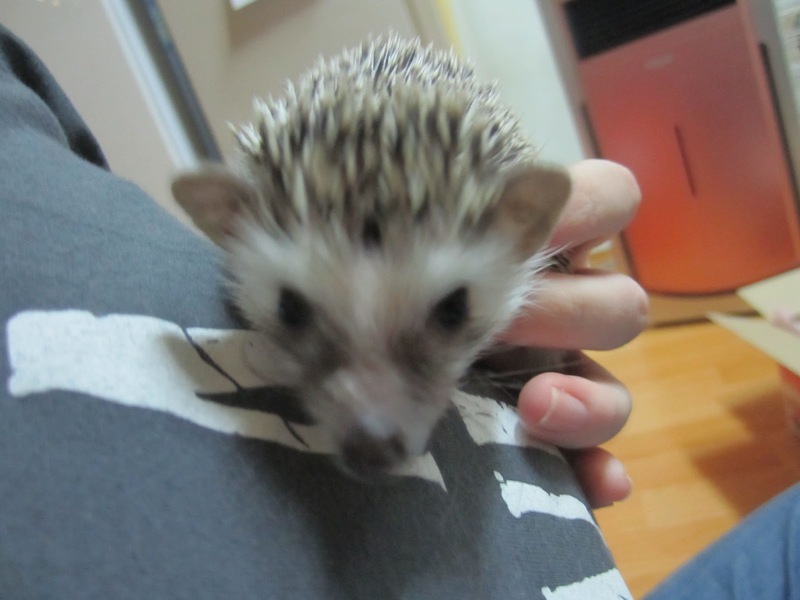 Finally, I put her tshirt (the one I brought her home in) in her cage and she burrowed into that. She is so different from Reggie. Reggie preferred his house to anything else and often disappeared inside. Rosie chooses the tshirt to burrow in over the house every time. Actually, today I just took it out! Reggie pooped up a storm on the wheel, but this morning I woke up and Rosie had barely gotten anything on the wheel. Maybe I can litter-train Rosie!! I was so happy going to bed, like a huge weight had been lifted off my shoulders. 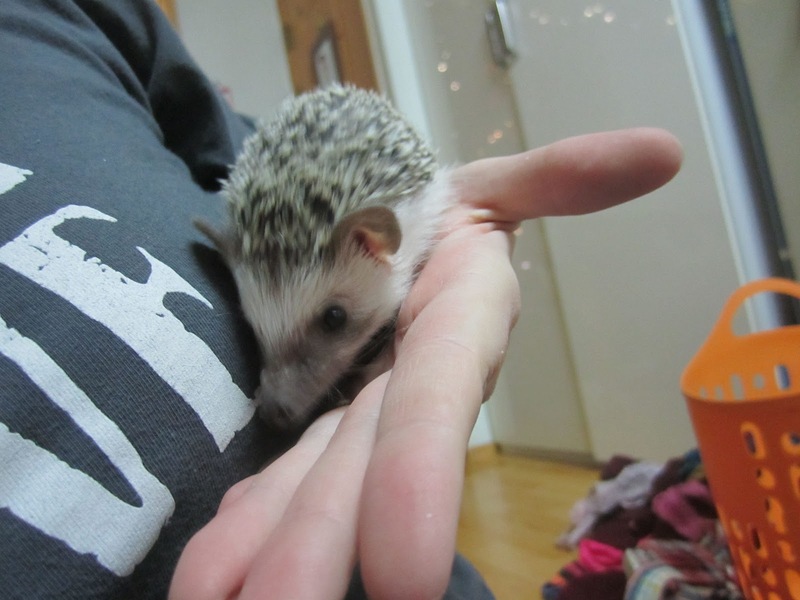 I tried to love Reggie, and I did in so far as he was a cute little creature and I just love all the cute animals. But, we had relationship problems that, if they were fixable, it would have taken a LOT of work. And, being completely honest, I didn't bargain for that. 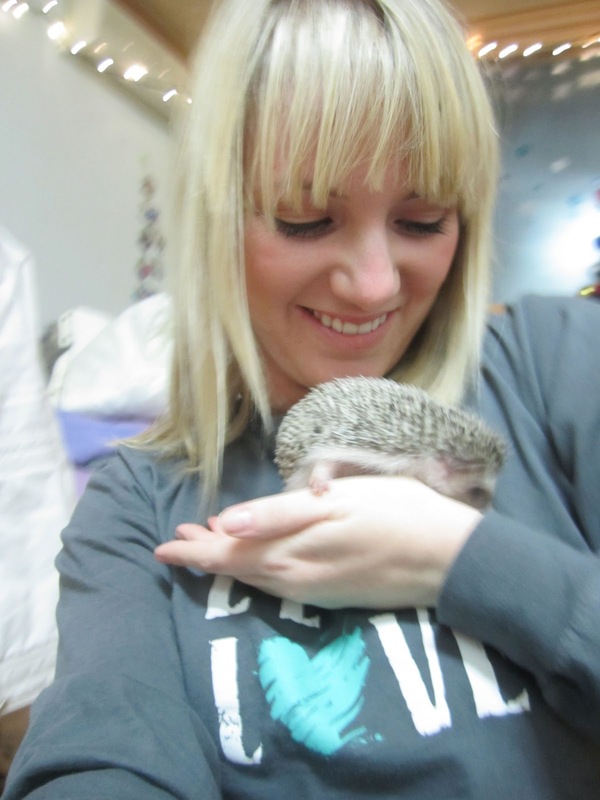 I wanted a pet that I could touch and hold and love. I still want a dog, but Rosie has definitely lifted my spirits and renewed my hopes for a loving pet relationship at the present time. This morning, I picked her up again. She was a little nervous but didn't bite, and relaxed quickly. 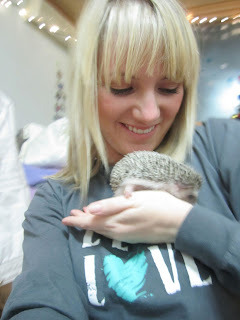 I admit, after having Reggie, I was pretty nervous to try to hold her. But, I just did it and it paid off! I noticed while holding her that her nails were pretty long. I'd put money on those being the main reason she could climb so well last night. I decided to take her to the vet after church. So, after church and lunch, I took Miss Rosie to the "VIP Vet" around the street (after putting a heating pack and her tshirt in her box). I love this vet! She is the same one I posted about with Reggie. They are open every day, but my specific vet doesn't work on Mon or Tues. They have night and late night service too. 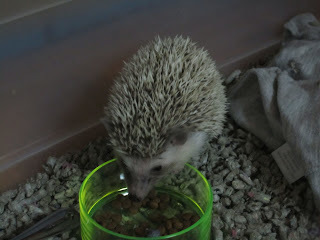 So, at the vet, she took a look at her skin to check for parasites (a common problem for hedgies). After coaxing Rosie out of her box (I understood her reluctance since she'd just been on a ride in the cold and was now being asked to hang out with a stranger), she used a realllly cool light thing (reminded me of what doctors use to look in our ears) that hooked up to a computer so she could see Rosie's skin. 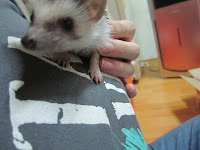 She said that Rosie does NOT have any parasites (YAY) but does have some dry skin. She said that will clear up if she is kept in a warm environment (I leave my heater on all the time basically) so that should get better too. She offered to do a preventative spray to keep away the parasites. I agreed! She said they would try to clip her nails, but wasn't sure if they could. Once Rosie was brought back to me, the vet said she was very well behaved and calm. She even let them clip her nails, although she didn't like having her leg pulled out from her body very much. She didn't charge me for the nails but the spray was 11,000W and the consultation was 3,300. So, for less than $15, Rosie got a clean bill of health and a preventative spray. I was very pleased! Yay! Rosie is a keeper! She is so adorable! I'm so glad it did work out to exchange. And wouldn't that be cool if she could be "litter trained?" I'm so glad you and Rosie found each other! I'm sure Reggie will be much happier wherever he settles down. You did the right thing! Rosie is so cute. I can't imagine how lonely I would have been if I hadn't gotten my kitty Leonardo a month after moving to Italy. It looks like she's already a real comfort!